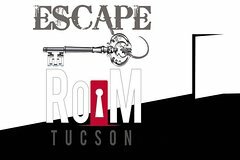 Escape Room in Tucson is a fun and real-life game. You are in a room with others and have to use elements of the room to solve puzzles, find clues and escape the rooms within 60 minutes. You will be locked in a room. The room will be unfamiliar and full of surprises. You will bring nothing in, but the room will be filled with useful and sometimes irrelevant objects. You will need to utilize them to escape. But be quick, you only have sixty minutes. You will need to use your mind. The room holds many secrets, some simple and superficial, and others secured and hidden away. Your thinking and problem solving skills will be put to the test, as you calculate your escape. Sometimes a key is not necessary to open a lock. You won't be alone. Two minds are better than one, and no experience brings people closer together than escaping capture. The room is unsolvable by one person, so you and your friends, family, partners and co-workers will have to work as a team to escape. Hysteria and frustration guaranteed. You will feel the atmosphere. The room is built to create an authentic experience with a fun atmosphere, strict attention to detail, unmatched realism and a captivating storyline. Every detail in the room, whether significant or not, is logical and realistic - but let's not get crazy, you will not have to open doors with piano keys or chess puzzles.